Toyouke has been doing these as long as we have. Thank you recappers, we love your snarky humor! If you have a recap to share, e-mail the link to Team BPR. Deadline is midnight Saturday each week. Project Runway Season 6 designer Christopher Straub joined Danielle and other fashion fans at a premiere party sponsored by l'etoile magazine. Click here for the full story. Thanks Jahna. Did you miss the premiere of Season 9? Click here to watch the full episode online. Click here for more from NYMag. 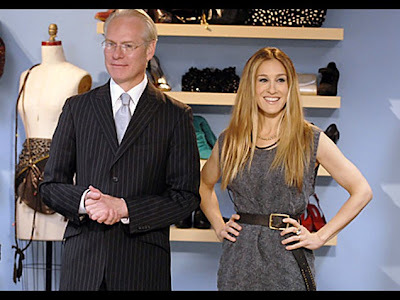 Click here for a selection of Project Runway's "Most Memorable Judges" from iVillage. 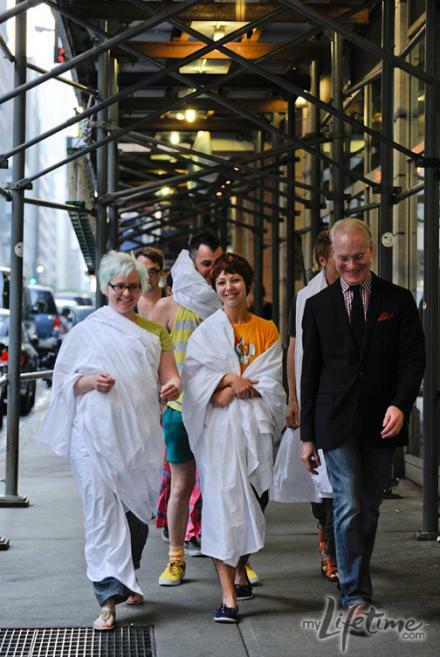 Click here to learn more about the Sauma family - owners of Mood Fabrics from the New York Times. The Times also reviews the premiere here. Nina Garcia would still like to see Jennifer Lopez as a guest judge. Click here for the story from Latina.com. That shirt Tim wore in the kiss and cry room looked awfully similar to a certain pair of boxer shorts used in the challenge? It was really quick and blurry, but in the lower left corner you will note something we have been advocating since the beginning of Project Runway. 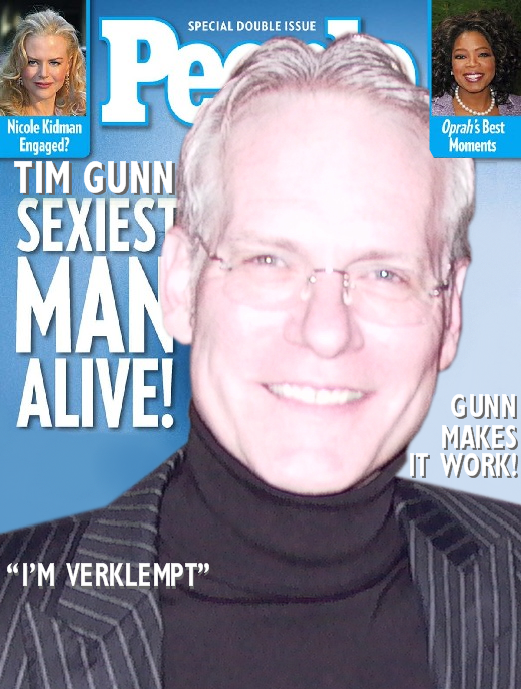 Tim Gunn is a producer! Last night's episode had a polish we haven't seen from the Bunim-Murray era and we suspect Tim had a big role in that. Don't expect any angry post-episode videos from the PR mentor this season. Congrats Tim! Photos courtesy of ProjectRunway.com. Click to see a larger view. You've seen the designs on the runway and now it's your turn to be the judges. This week you are Heidi Klum, Nina Garcia, Michael Kors and Christina Ricci. Season 9 got off to a dizzying debut as we started with 20 designers and ended up with only 15. Five designers eliminated in one episode must be a new Project Runway record. Post your reactions to Episode 1 here. Tbone and suzq will be hosting our popular live party room starting with the "Road to the Runway" special at 8:00 p.m. ET. We're looking for our usual crowd of crazies to chime in along with some newcomers. All are welcome! Live play by play of the Season 9 premiere begins at 9:00 p.m. If you are out of town or without Lifetime access, we'll give you the first episode scoop as it happens! After the show, share your thoughts on the new season, the challenges and the judging decisions in our weekly reactions thread. 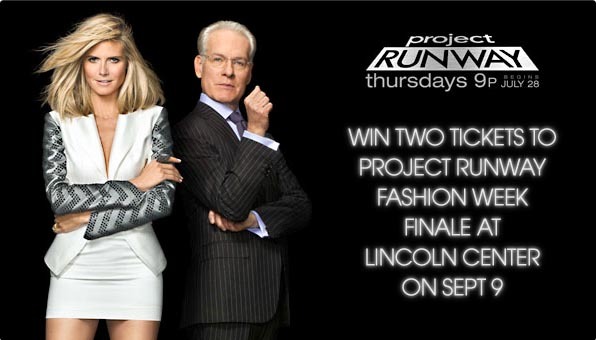 This is a huge night for Project Runway fans, 2.5 hours of programming for the Season 9 premiere. Come join the fun with us tonight right here at BPR! 1. Anya has only been sewing for four months? Is it possible that she can really pull this off, or will she be exposed as a fraud? Will the judges praise her work and justify their decision to cast her? What makes someone "a designer?" 2. What is the status of the four designers who are cut? Will they be considered alumni? Will they be invited to the Reunion? Will they have seats at the Finale? Will they be allowed to audition for future seasons? 3. Is Olivier's name pronounced "Oliver?" 4. You are sharing an apartment with three strangers. Camera operators, producers and possibly Tim Gunn could stop by any morning...and you're gonna wear THAT???? Project Runway All-Stars - Miranda Kerr? Georgina Chapman? Click here for the scoop. Will Christian Siriano be a Season 9 Judge? 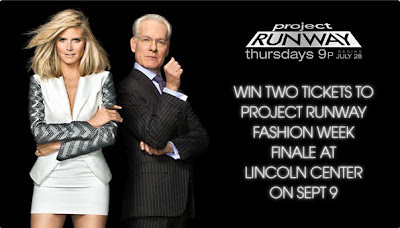 Most of you die-hards know by now that Project Runway Season 9 premieres this Thursday at 9:00 p.m. Right? Right. But did you know that Lifetime has dusted off the old "Road to the Runway" special, featuring the casting sessions for the new season? It's always been a favorite feature of ours and we are glad to see it return. Tim Gunn will host and it is scheduled to air at 8:00 p.m., right before the S9 premiere which means 2.5 hours of PR goodness. We'll probably start the party room early so plan on spending the bulk of your evening parked in front of your TV and plugged into BPR. It is shaping up to be a fun (and long) night! Heidi Klum on "Regis and Kelly"
Heidi talks about the premiere of Season 9. 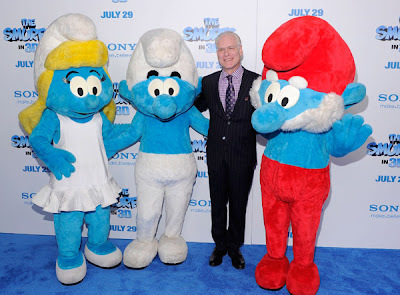 "The Smurfs" opens nationwide on Friday. This image is from which season's finale? Who designed the dress on the model? Who designed the dress on Heidi? No prize - this is just for fun! Season 9 Teaser: Tim Gunn Jogs! Tim Gunn and Heidi Klum Deliver Meals for "God's Love We Deliver"
On the hottest day of the year in New York City, Heidi and Tim joined other volunteers to deliver life-saving meals to vulnerable clients in NYC. They were joined by volunteers, Board member Desiree Gruber and Karen Pearl, President & CEO of God's Love We Deliver. God's Love is New York City's leading not-for-profit provider of life-sustaining meals and nutritional counseling for people living with life-threatening illnesses. We are dedicated to cooking – and delivering – the specific, nutritious meals a client's severe illness and treatment so urgently require. We support families by providing meals for the children and senior caregivers of our clients. All of our services are provided free of charge, and we are proud that in our 25 year history, we have never had a waiting list. Project Runway Season 5 Champion, Leanne Marshall was the featured designer at "Fashion Week Panama" on July 16th. 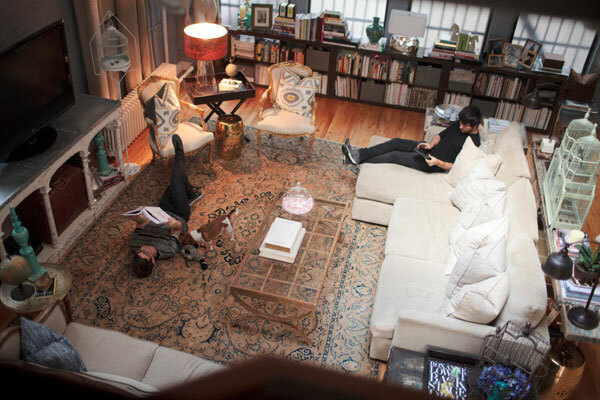 Check Out Christian Siriano's Chelsea Apartment! Christian Siriano and Brad Walsh have one of the most stylish apartments in Chelsea. Check out the full story (and lots of photos) here at Refinery 29. 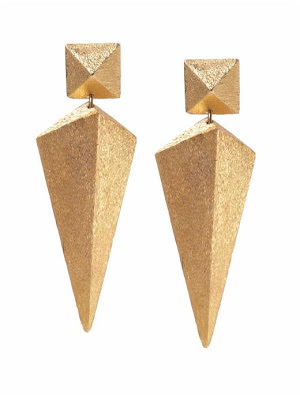 Project Runway Season 8 Champion, Gretchen Jones has designed a unique jewelry collection for Piperlime. Prices range from $48 - $120 and net profits will be donated to Aid to Artisans. Click here for a video recap of the episode. LOVE this! Click here for a recap from Reality Ravings. Nick's dress is in the "flashback" scene! Congratulations to Nick Verreos and David Paul! "Two more weeks" of filming. Episodes will be 90 minutes long again. Also interesting: But Klum wants to clear one thing up about the judges. "We're just doing (Project Runway), we're not doing the Accessories show or the All Stars show. A lot of people are confused. We're not doing any of the spin-off shows." Click here for the full story from USAToday. 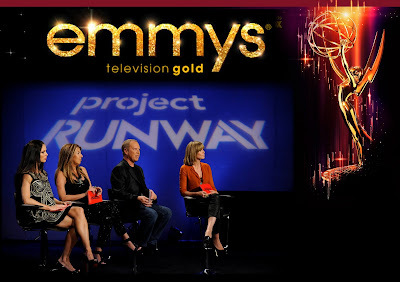 Project Runway Season 3 designer, Malan Breton has been nominated for a WGSN Global Fashion Award. 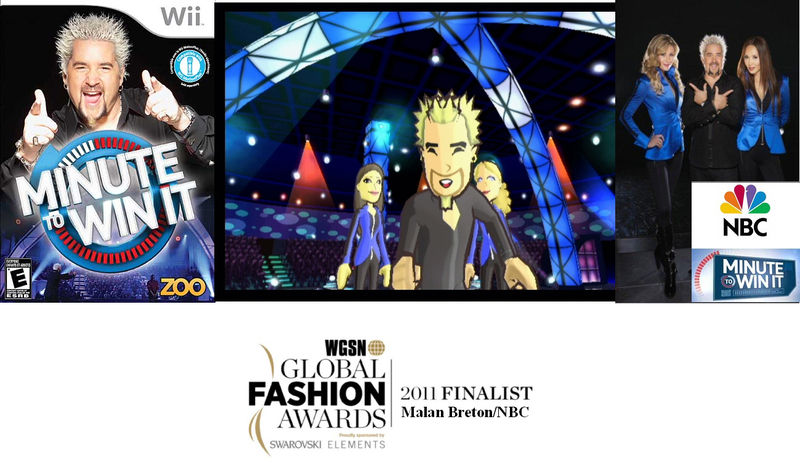 Malan is nominated in the "Outstanding Fashion Collaboration/Collaborator" category for his work on "Minute to Win it." Also, the design has now been immortalized in a video game for Wii! Once again Project Runway has been nominated in multiple categories for a Primetime Emmy. The show was nominated for 'Outstanding Reality - Competition Program' and for 'Outstanding Picture Editing For Reality Programming' for the 'There is an "I" in Team' episode. Congratulations to Lifetime, The Weinstein Company, Miramax Films, Bunim-Murray Productions and Full Picture for this honor. Viktor is 30 and lives in New York. He attended FIT in NYC. Viktor's style icons are Daphne Guinness and Bjork. Click here to learn more about Viktor. Serena is 31 and lives in Brooklyn. She has an Associate's degree in fashion design from FIDM, San Francisco. Serena also auditioned for season 1. Click here to learn more about Serena. Rafael is 27 and lives in Atlanta. He majored in fashion design and fashion marketing at American Intercontinental University. Click here to learn more about Rafael. Olivier is 22 years old and lives in New York City. He went to design schools in London and Milan. Besides designing, Olivier enjoys Playing piano, cello, photography and traveling. Click here to learn more about Olivier. Laura Kathleen is 26 and lives in St. Louis. She has a Bachelor of Science degree in design, merchandising and textiles. She has been auditioning for the show since season 5! Click here to learn more about Laura Kathleen. Kimberly is 35 and lives in Brooklyn. She majored in Fashion Merchandising Management at FIT. Her dream celebrity client is Jennifer Hudson - and I was thinking that she LOOKS like Jennifer Hudson. What do you think? Click here to learn more about Kimberly. Julie is 35 and lives in Grand Junction, CO. She has a degree in Fashion Design from SCAD. "Looking back now, I don't know if really regret any clothing or accessory. However, I do regret trying on a pair of Rollerblades." Click here to learn more about Julie. Joshua McKinley is 25 and lives in Sunnyside, NY. He has a BFA from The Fashion Institute of Technology; Polimoda, Florence, Italy. His favorite Project Runway designer is Stella Zotis. Click here to learn more about Joshua McKinley. Joshua is a menswear designer and his dream celebrity client would be David Beckham. Click here to learn more about Joshua. Gunnar is 21 and lives in Louisville. He is a self-taught designer and works as a hairstylist. His favorite designers are the Mulleavy sisters of Rodarte. "How fantastic that two sisters who were completely self-taught, and were the weird kids growing up, grew up to blossom into a fashion revolution." Click here to learn more about Gunnar. Fallene is 29 and lives in Denver. Click here to learn more about Fallene. David is 29 and lives in Boston. He is a self-taught designer. "My Fine Art training has given me a good sense of proportion and shape. I am best at structured, tailored looks. Pattern drafting is my number one strength"
Click here to learn more about David. Danielle is 26 and lives in Minneapolis. She feels that her weakness as a designer is gowns and hopes there won't be a red-carpet challenge. Click here to learn more about Danielle. Cecilia is 34 and lives in New York, NY. She is a mostly self-taught designer and has been married for 10 years. "I hate sketching. I do specs and flats for my own reference. I only sketch for show and when I have plenty of time (almost never.)" Click here to learn more about Cecilia. Bryce is 26 and lives in Portland, Oregon. He has a Bachelor of Fine Arts in Apparel Design from The Art Institute of Portland. Ugg boots, humor tees, sweatsuits, and anything attached to the Kardashians drive him crazy. Click here to learn more about Bryce. Bert is 57 and lives in Los Angeles. He attended Parsons School for Design and the New School in NYC from 1975-1977, studying fashion design. Click here to learn more about Bert. Becky is 38 and lives in Portland, Oregon. She went to school for two years for interior design, two years for theater set design and four years for apparel design. "I know what works on women's bodies. I have a keen eye for color and pattern, I am focused and organized, and I have fun with design." Click here to learn more about Becky. Anya is 29 and lives in Port of Spain, Trinidad and Tobago. She has a degree from Parsons School of Design. "I am highly competitive, I have many of the elements that comprise a winner on this show, and I have a deep passion for representing not just me but also where I am from, on an international scale." Click here to learn more about Anya. Anthony Ryan is 28 and lives in Baton Rouge. He received a Bachelor of Arts in fashion design, with a minor in business, from Louisiana State University in 2010. "I'm both red-green and blue-yellow colorblind, so the way I see solid colors is a little different, and it's probably my biggest weakness in design." Click here to learn more about Anthony Ryan Auld. Amanda Perna is 24 and lives in New York, NY. She is a graduate of The University of Alabama Apparel Design Program, and won a Henrietta Thompson Fashion Achievement Award at UA in 2008 for excellence in fashion. Click here to learn more about Amanda. Project Runway Season 9 Designers Announced! Amanda's favorite purchase? Rain boots. She is the one person praying for rain, just so she can show them off. She also been known to form crushes on shoes. This Southern boy is known for wearing skinny jeans and boots. Impressively, he found a pair of Gaultier glasses in France that just happened to be his very own prescription. They're his most expensive fashion splurge -- and correct his vision! Anya walks into Season 9 with some serious bragging rights: she lives in tropical paradise (Trinidad and Tobago) and competed in the 2008 Miss Universe Pageant. This Portland, OR native first started making clothes for her Barbie dolls. You'll never see her wearing something white or boring -- she is all about the color, including making sure all of her closet hangers are all of the same color. His dream celebrity client is Oprah. After recently returning to fashion designing after a stint in retail, he used to sketch ideas on the back of register tape. Bryce Black worships at the altar of Gaga. Flip through his designer portfolio, and her name will be the answer to many design inspirations and client aspirations. Cecilia only wears clothes she makes. Only. Her supermodel muse is Cindy Crawford. Danielle is currently an intimates designer for Target. One of her recent collections was inspired by suiting. David claims that his entire teenage years were riddled with bad fashion choices. The worst offender? Wide-legged JNCO jeans. If Fallene's name sounds familiar, Disney movie fans, it's because she is named after Bambi's girlfriend. This Denver, CO resident impressed the guest judges in her audition by creating her own textiles. Gunnar is a hair stylist by day and a self-taught designer by night. His closet is filled with lots of jackets (he loves dark colors) and unique jewelry finds. Joshua is one of the few people who have removed his shirt during a casting session, and we thank him for this. He listens to Katy Perry while designing. Always on the go between his home base of LA and Vegas, Joshua loves staying comfortable in t-shirts. He loves working with bright colors. Julie loves tweeds and stripes and in her southwest sportswear-inspired pieces. 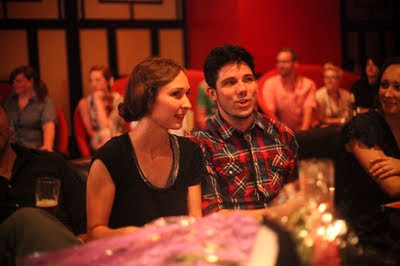 Guest judge Seth Aaron Henderson called her presentation at her audition fashion-week ready as a collection. Singer Kelly Rowland provides some musical motivation to Kimberly when she's designing. This self-taught designer wore her own design to her audition. Laura Kathleen's style icon is Marilyn Monroe. You'll spot a huge poster of the film icon on her closet wall. She also loves vintage items and the label St. Johns. Olivier has a fabulous accent, only rivaled by Malan Breton. His closet features a very Mister Rogersesque prize sweater that he bought for a mere five pounds! Rafael has a marching band jacket in his closet. This begs the question, "What instrument did he play ... and is it just a coincidence that he kind of looks like Prince his is publicity shot for the show?" Serena has a photo of a Marc Jacobs bag on fire in her living room. She is careful to note that it is not Marc by Marc, so watch out! Viktor has a pair of church shoes in his ridiculously organized closet. His most expensive clothing purchase? A Prada shirt. Please stay tuned to BPR for more about the season 9 cast! 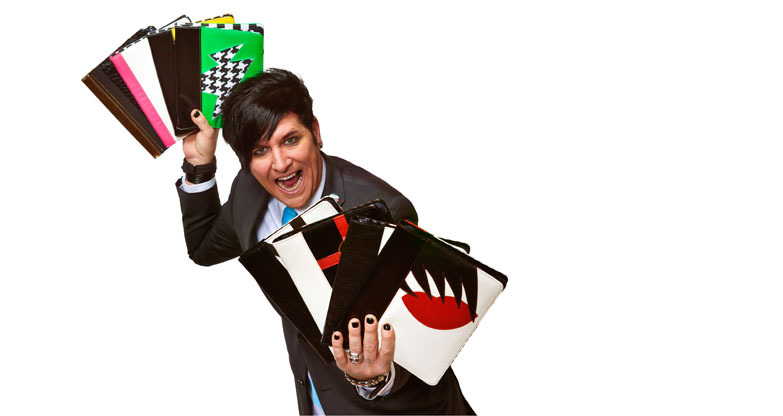 Project Runway Season 7 Champion, Seth Aaron Henderson has designed a collection of iPad 2 covers for Maroo. The covers are designed in Seth Aaron's signature style with bold colors and graphics. All eight design concepts were created by Seth Aaron himself. All covers are hand sewn to give each a sense of personality and subtle difference. Regarding his design decisions, Seth said, "In my line of iPad covers, I avoid fashion trends and focus on innovation, texture, and elements that will make a statement of individuality for years to come." BPR's own contest winner, Frank Huynh, took third place in Simplicity's "SuedeSays" Rock Your Look contest. Click here to read more from all of the winners! PINK JAMS! brings the Spring 2012 couture collection of Christian Siriano direct from the runways of New York’s Fashion Week to Washington, D.C. at the International Trade Center in Washington, D.C on Friday, October 21. The breast cancer awareness charity will present a live-music fashion show, Pink Rocks the Runway™ (www.PinkRockstheRunway.com), which will mirror the Fashion Week experience featuring headliner and Annapolis native, Siriano who will showcase his entire Spring 2012 collection on the runway, as well as fourteen of Washington, D.C.’s hottest designers. Signature pink couture designs from local designers are being created for this event and modeled by young breast cancer survivors. “I am proud to collaborate with Pink Jams! to raise breast cancer awareness for young women in the DC area. Pink Rocks the Runway will be fun and fantastic. I am excited to come home and bring the New York fashion scene with me,” said Siriano. Diana Eng Creates "Laser Lace"
Sneak Peek of Tim Gunn in "The Smurfs"